On previous posts, we have presented the Italian wine district of Valtellina and introduced one of the finest Valtellina wine producers, Ar.Pe.Pe. along with a tasting of their wines. On this post, which concludes our mini-series about Valtellina, you can find an interview that Ar.Pe.Pe.’s enologist and co-owner Isabella Pellizzatti Perego was kind enough to do with me. Q1. First of all, would you care to explain the logic behind the various labels in your lineup and their release to the market? I understand they are not all available every year, so maybe you can elaborate a little bit on that? A1. Certainly: essentially, we are pretty black and white with our production – let me try to explain. At the top of our range there are the following four Crus or Riservas: Grumello Buon Consiglio; Sassella Rocce Rosse; Sassella Vigna Regina; and Sassella Ultimi Raggi. These current Crus will soon be complemented by two new Crus that we have started making since the 2009 vintage and that are currently at the beginning of their aging phase. These new wines will be released to the market in 2018: one is our first Riserva from our vineyard in the Inferno subzone and the other one is a new Riserva from our Grumello vineyards that is going to complement our Buon Consiglio Cru. Beside those, we have the Inferno Fiamme Antiche which, so far, is the only label that we make from our vineyard in the Inferno subzone. When our new Inferno Cru becomes available, the Inferno Fiamme Antiche will be its second vin. 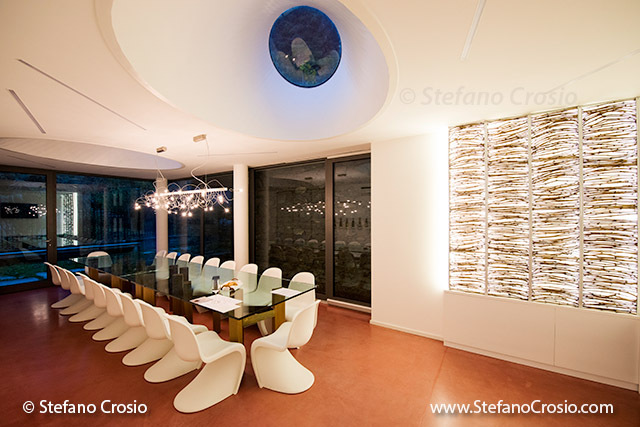 Finally, there is our entry-level, easy and ready to drink wine known as Rosso di Valtellina. Now, the Rosso di Valtellina is the only one of our wines that is available every year. Instead, our concept for our premium wines is that, depending on our assessment as to the quality of the grapes we harvest, we decide whether they are worthy of a Cru or they should be “downgraded” to second vin. 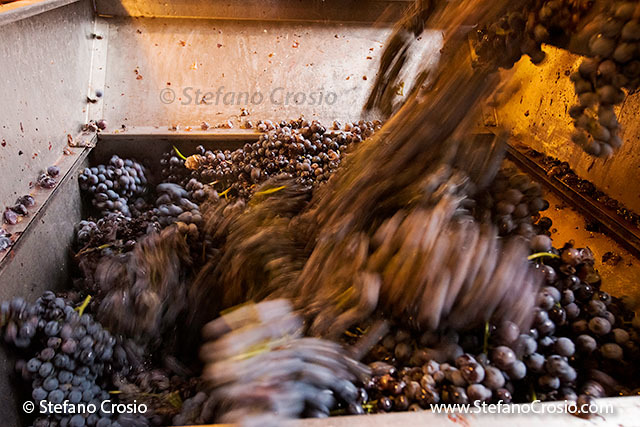 We do not compromise: the entire crop for each subzone either becomes a Cru or a second vin. So, for instance, if one year you see that we release the Grumello Buon Consiglio Riserva, that means that for that year the Grumello Rocca De Piro will not be released, and vice versa, which of course entails a significant sacrifice in terms of revenues. 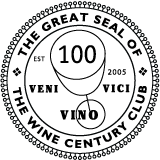 But we are happy this way: we want to stand behind the quality and reputation of our wines and we do not take any shortcut to do so. Q2. 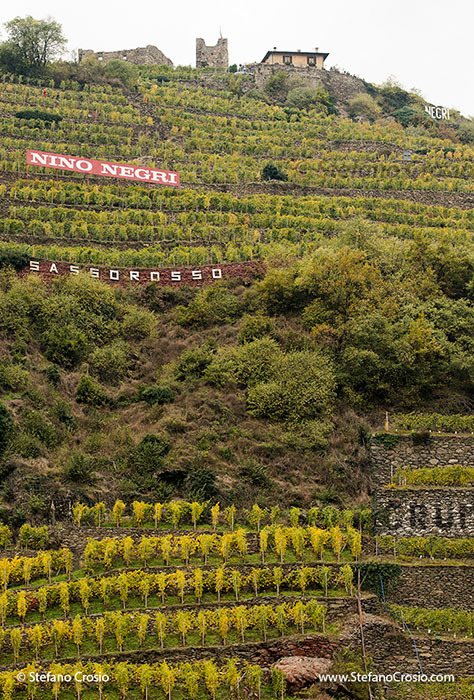 The mountain Nebbiolo of Valtellina has been recognized as a biotype that is geographically distinct from Piemonte’s Nebbiolo and several clones have been identified. Can you tell us something about the clonal choices that you made in your vineyards? A2. Valtellina’s Nebbiolo presents greater biodiversity in its clones compared to Piemonte’s Langhe Nebbiolo (where the three main clones are Michet, Lampia and Rosé). In Valtellina at least 10 different clones have been identified. For our vineyards, we have selected a mix of the various clones and we are observing how each of them has adapted to our terroir and how it performs. This way, we can identify the vines that perform best and then use those same clones to add new vines or replace existing ones. Q3. Let’s talk a little bit about viticulture: what’s the average density and age of your vineyards? Are your vines all grafted? Which month of the year do you harvest and is it all done by hand? A3. Our average density is 5,500/6,000 vines/HA and on average our vines are 50 years old – most are grafted, but there still are a few plants that are ungrafted. We harvest exclusively by hand due to the characteristics of our territory, which prevent the use of anything mechanical. It is pretty much the same for all of the Valtellina producers, although some (such as Nino Negri) go as far as using helicopters to carry the crates with the harvested grapes as fast as possible to the winery. In general, we harvest the grapes for all our wines in the second half of October, except only those for our Ultimi Raggi Cru (which is our late-harvest wine) which get picked in the second half of November, just before the first snow of the season. Q4. Speaking of the Ultimi Raggi: this is a wine that falls within the Valtellina Superiore Riserva DOCG appellation (subzone Sassella). Since it is a dry raisin wine, can it be considered your own take of a Sforzato della Valtellina? Why does it not fall within that separate DOCG? A4. Well, yes and no: our Ultimi Raggi is a late-harvest dry raisin wine like a Sforzato, but it cannot be classified as such as the regulations for the Sforzato della Valtellina DOCG appellation require that the grapes be picked during the regular harvest season and then be dried on straw mats (in other words, it is not a late-harvest wine). Instead, with the Ultimi Raggi we have made the choice of drying the grapes while they are still on the vine, by picking them generally a month later than the regular harvest. It is a riskier choice, because a few years ago we had just finished harvesting the last vines for the Ultimi Raggi when it started snowing: had it happened one day earlier, a large part of our harvest would have been lost. So, it is a riskier choice, but we feel that it really pays off in terms of the quality of the wine that we make. Q5. How do you feel about organic viticulture? Is it something you are considering embracing? A5. We practice an integrated approach to viticulture, which imposes very restrictive practices already. We would love to go all the way to organic, but considering our geography, that is made of steep mountain slopes and makes it impossible for us to mechanize anything, currently we are not in a position to incur even greater labor costs. Just think that the integrated viticulture approach that we practice results in 1,300 working hours per year for each hectare of vineyards: more than twice the number of man hours that are required in Piemonte’s Langhe and about three times as many as those required to harvest hill vineyards in general. Q6. 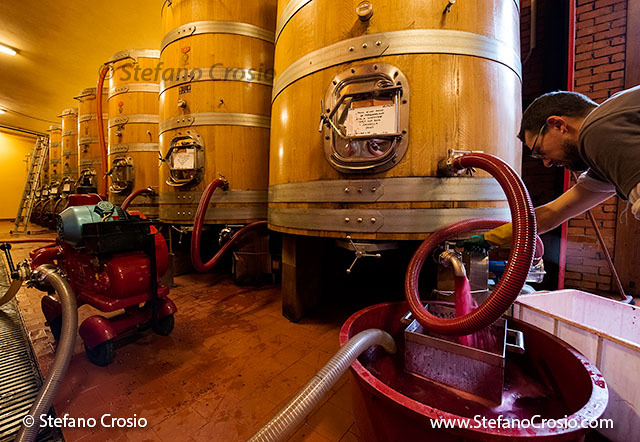 Let’s move on to your ultra-conservative winemaking choices: what kind of vats do you use to ferment your wines? Also, do your wines do malolactic fermentation? And for both fermentations, do you use selected yeasts and acid bacteria or are both fermentations spontaneous? A6. We still use 50 HL wood barrels to ferment our wines: we have them made using the same traditional, proprietary mix of oak, chestnut and acacia that we use for our aging barrels. Then, after each fermentation, we gently scrape the inside of the barrels to remove any possible residue. It is a lot of work compared to just using stainless steel vats, but we think it is worthwhile because of the additional flavor and smoothness it contributes to our wines. 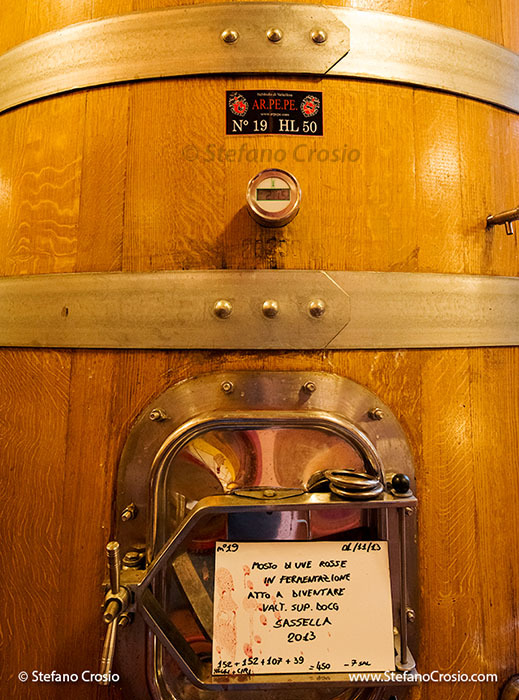 All of our wines go through a couple of day of pre-fermentative cold maceration to maximize the extraction of color and primary aromas, then they go through spontaneous alcoholic fermentation using only indigenous yeasts and finally they do a full, spontaneous malolactic fermentation that is kick started by careful temperature control. Q7. What kind of barrels do you use for aging your wines and what is the main driver for your choice? A7. As is the case for our fermenting vats, we use large 55 HL wood barrels for aging our wines too: these are made of a proprietary mix of oak, chestnut and acacia woods that we have traditionally been using from the very beginning. We also have a few smaller 5.5 HL tonneau casks made of the same wood mix that we sometimes use, but it is an exception. In addition, none of our aging barrels is toasted: we only use un-toasted wood to minimize the release of tertiary aromas/flavors to our wines. We made this conservative choice because we want our wines to underscore primary and secondary aromas and to be a reflection of their unique terroir. Anyone can add spicy notes to a wine that, in itself, could be not very exciting: we want our consumers to appreciate our wines for the story they tell about our grapes, our territory and the environment our vines grow in. Q8. Speaking of terroir, how would you briefly describe that of your vineyards? Also, how would you say that the wines made from grapes grown in the three different subzones you have vineyards in (Sassella, Inferno and Grumello) differ from one another? A8. The Valtellina district of Lombardia counts a little over 800 HA of vineyards altogether, and our grapevines grow on mountain slopes at an average altitude ranging from 400 to 600 mt (1,300 to 2,000 ft) above sea level. The soil here is scarce, as rocks abound. This is also one of the main differences between the Grumello subzone versus the Sassella and Inferno subzones: the former has somewhat more soil, it is less rocky and this makes for easier, readier to drink wines, whilst the latter subzones have very little soil and rocks prevail – this makes the wines coming from these areas more austere and dependent on longer aging periods to properly assemble and integrate their components and smooth their edges. Q9. Now, regarding the commercial aspects of your business: your annual production is about 60,000 bottles – what is roughly the split between export and domestic consumption? Which are the top three countries to which you export? A9. This year marks the first time that we export more than we sell domestically: 60% of our production has in fact been exported. Geographically, the USA is the top country we export to, Japan is the second and Russia (which we just started exporting to this year) came in third. This year we also started selling to a few new countries beside Russia, among which Hong Kong, Taiwan and a market that we are excited to finally be in Canada – our Rosso di Valtellina will be soon available in Quebec and we are very excited about this new challenge. Q10. Finally, are there any new projects that you are working on that are worth pointing out to our readers? A10. Yes, definitely. We already talked about the two new Crus which will become available in 2018, for which we are very excited and feel very strongly about their quality and potential. Beside such product news, from a viticultural perspective we have decided to convert our vineyards to the Simonit-Sirch pruning method for controlled grapevine growth. In the context of a Guyot-type training system like the one we use in our vineyards, this method has the objective to optimize the performance of each vine through selective pruning of only young (one or two year old) stems growing out of the head of the trunk. The purpose of this is to cause the vine to develop two main stems that originate from opposite sides of the head of the trunk and run parallel to the bending wire, giving the vine a characteristic T-shape. This optimizes the canalization of the plant’s lymph into such two main vessels and makes a vine grown with a Guyot-type training system more similar to a free-standing bush vine, which nowadays is considered the most efficient vine training system and one that considerably increases the life expectancy of the vine. 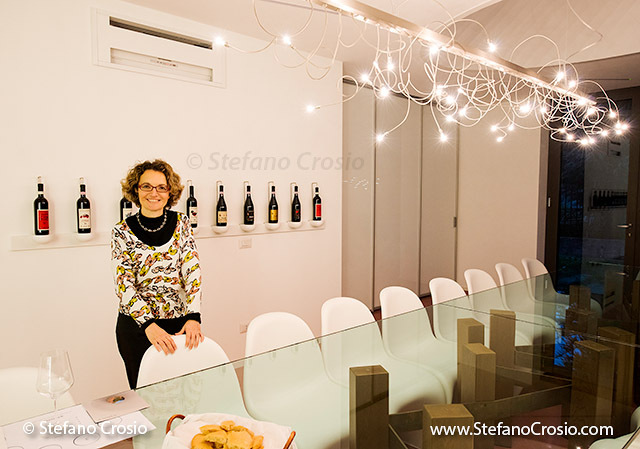 This entry was posted in Meet the Maker, Wine, Wine Education and tagged Ar.Pe.Pe., ArPePe, Chiavennasca, DOCG, education, enologist, Interview, Isabella Pellizzati Perego, Italian, Italy, Nebbiolo, red, Superiore, technique, Valtellina, wine on December 18, 2013 by Stefano.